Simon Lambert was in top-scoring form for Panthers against Sheffield. He got the big crowd, he got the great atmosphere and he got the terrific performance – no wonder Peterborough Panthers supremo Ged Rathbone was sporting a smile as wide as his side’s margin of Premier League play-offs quarter-final victory last night (September 27). The city racers overcame a few hitches to complete their passage into the semi-finals with a 51-38 second-leg success, to complete a 97-82 aggregate triumph over Sheffield in their grudge match. It certainly wasn’t a cakewalk as three riders – Michael Palm Toft, Anders Thomsen and Rafal Konopka – all survived high-speed crashes during an eventful clash at the East of England Showground. But Panthers prevailed with three races to spare after Thomsen stormed past fellow Danish ace, and Tigers top-scorer Nicolai Klindt, for a scintillating triumph in heat 12. Rathbone said: “I can’t thank all the people who turned out enough. We don’t know an exact figure as yet but it’s safe to say it was our biggest crowd of the season by a distance. “I wanted a sea of red and black, I wanted flags and I wanted noise. I got the lot and I know it made a huge difference to the riders. “The backing the riders received from start to finish was incredible and it just proves again that we did the right thing last winter when stepping in to keep the club going. “We made life difficult for ourselves at times with a few crashes and a couple of mechanical breakdowns, but just as we have done all season, we overcame them. The fans turned out in such force that the start of the meeting was delayed due to crowd congestion – an occurrence about as common as praise for the British Speedway Promoters’ Association! Some supporters were still settling into their seats when disaster appeared to strike for Panthers as Palm Toft took a crashing fall going into the first turn in the second attempt to stage the opening race. The Dane received lengthy treatment from paramedics and club sports therapist Lauren Wood (probably the busiest woman inside the Showground today) before being given the all-clear to continue. He responded by leading home Ben Barker in the re-run for the first of four 5-1s in the opening six races as Panthers took command – and the first chunk of his 12+1 haul which shared top-billing alongside that of stand-in skipper Simon Lambert. It would have been five full-houses for Panthers in that powerful opening spurt had a mechanical issue not forced Konopka to tumble out of second spot in the second race, but the hosts were still well on top. 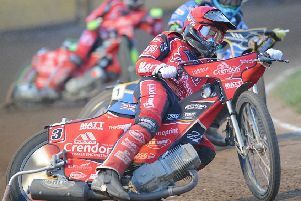 The impressive combination of Klindt – who had a miserable spell as a Peterborough rider back in the club’s Elite League days – and former British Under 21 champion Josh Bates certainly weren’t about to wave the white flag though. They combined for two 5-1s of their own in the space of four races to ensure Sheffield retained faint hopes of a fightback. They arrived either side of a heat nine spill which left Thomsen nursing possible scaphoid damage. He was brought down in a tight, second-bend incident which also left Tigers reserve Michele Castagna on the deck. But the scariest moment of all arrived in heat 11 when Konopka lost control going through the fourth bend before man and machine flew into the fence. It was an incident which brought back memories of the horror crash involving Lewis Kerr in the Premier League Fours event back in early August. The re-run of that race ended in a 3-2 as Panthers moved onto the brink of overall victory. Barker not only saw off Andre Compton but also lapped the struggling Castagna, who had been beset by bike gremlins. Thomsen is another man clearly made of stern stuff as he shrugged off the pain of his own spill to seal overall victory in style by blasting past Klindt in heat 12, but arguably the finest individual contribution of the entire night came from a visiting rider. Stand-in Sheffield skipper Bates brilliantly scythed from third to first in a shared heat 14 before helping his side to a consolation 4-2 in the finale, but this night and this tie was all about Panthers. Their reward is a semi-final showdown against table-topping reigning champions Edinburgh, who lifted the League Cup today. It’s a formidable task but one they will relish with the first leg at the East of England Showground next Sunday (October 4, 5pm) ahead of a return clash in Scotland on Friday, October 9. PANTHERS: Simon Lambert 12+1, Michael Palm Toft 12+1, Emil Grondal 11+1, Ben Barker 8+2, Anders Thomsen 8+1, Rafal Konopka 0, Rider replacement for Ulrich Ostergaard. SHEFFIELD: Nicolai Klindt 13+1, Josh Bates 10+1, Andre Compton 6, David Bellego 4, Michele Castagna 3+1, Robin Aspegren 2+1, Kyle Howarth (guest) 0.